The Southern California Shakespeare Festival's Second Stage Series continues during its Celebratory Season 15 to support new plays and stage readings of contemporary and classical works. 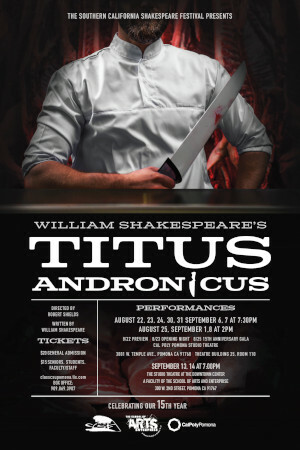 Please join us for this exciting new theatrical venue in the Studio Theatre after the performances of "Titus Andronicus." TICKETS WILL GO ON SALE May 20, 2019. We have a limited number of tickets for sale before each performance during Box Office hours before each show. • The Box office is open on our Saturday performance nights 5-7 p.m. and on our Sunday matinees from 11:30 a.m.-1 p.m.
• SCSF performs in the Studio Theatre, which is an intimate space of 86 seats. Reservations must be made in advance as we sell out quickly. All tickets must be paid for in advance, and there are no refunds. • We have a limited number of tickets for sale before each performance during Box Office hours before each show. Please pick up your tickets by 7 p.m. for Saturday night performances and by 1:45 p.m. on Sunday for matinee performances. • All tickets will be released at the times listed above. • There is no late seating. Please plan on arriving at the theatre by 7 p.m. to pick up your tickets for the 7:30 p.m. curtain and 1:45 p.m. for the matinee at 2 p.m.
• Concessions open at 6:30 p.m. on Saturday performances and 1 p.m. for Sunday matinees.